Home / Blog / Is the Full Moon Party worth it? If you ask our opinion to the question “Is the Full Moon Party worth it?”, we would answer, “Yes!”. Definitely yes, the Full Moon Party is worth your money and time. Those who don’t believe our word should keep reading and decide themselves is this monthly festival for them. What is this event, and is the Full Moon Party worth it? The Full Moon Party is one of the most popular travelers’ events in Asia and Thailand. Thousands of people travel to the island of Koh Phangan every year just to take part in the monthly event. After one time, you usually want to return just to experience the laid-back atmosphere again. The party lasts for a whole night and you can experience many different activities. From dancing to music by world-class DJs to buying colorful Full Moon Party souvenirs. 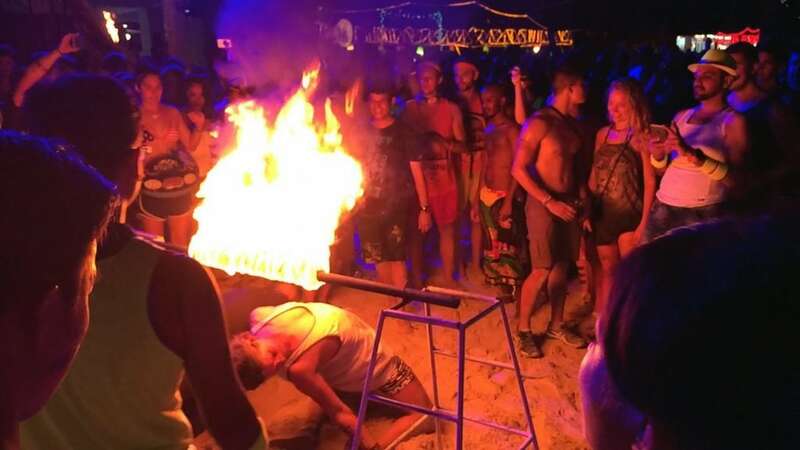 When compared to other beach parties in Thailand, Asia, and around the world, the Full Moon Party has more history behind it. There’re many activities that have been part of the party for years like the fire jump rope, using colorful paints, black lights, and live music. It’s hard to find an event as colorful, fun, and friendly as the Full Moon Party – especially because it costs almost nothing. Every monthly festival has thousands of attendees and sometimes the biggest parties, like the New Year’s Full Moon Party, may have even tens of thousands of travelers having fun and dancing around. Usually, these people paint themselves with different neon colors and glowing paints that look unique in the black lights. It’s easy to make new friends in the Full Moon Party. Just have conversations with random travelers or book a bed from a hostel and get to know your fellow travelers. Everyone is open to meeting people from different cultures. Use our website and plan your trip to Thailand’s famous Full Moon Party. Check the next party dates, book your accommodation, and read more about the event from our guides. We share a lot of important information you should know before travel to the Full Moon Party. For example, read about the transportation, activities, or ideas for body paints.